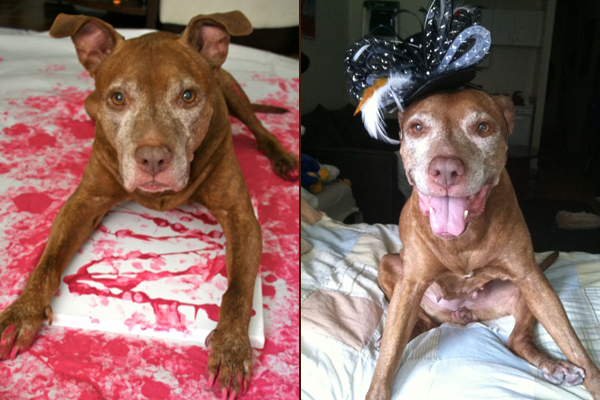 Elsie’s story began in a way that is, sadly, not unfamiliar for many pit bulls in New York City. In 2006, she was picked up off the streets by Animal Care and Control in Manhattan, where she quickly became the staff favorite, but also ended up on the euthanasia list as so many of pit bull type dogs do. Thankfully, they reached out on Elsie’s behalf and were able to find her a foster home before she found her forever home a few weeks later with me. Elsie’s “mug shot” is the only clue to her first few years of her life. 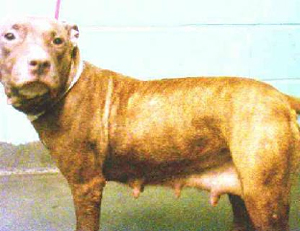 When they picked her up, she had obviously just given birth to a litter of puppies. Where she had them or where they ended up we’ll never know. Elsie was most likely used as a breeder dog and then simply discarded, an all too common practice. A rough beginning has turned into a love affair. Elsie and I are best friends, roommates, couch coddlers, bed buddies, walking partners and so much more. This made it all the more devastating when in 2009, after only three years together, Elsie had a tumor removed that turned out to be breast cancer. Research has revealed that simply spaying female dogs before their first heat can prevent breast cancer completely. Thankfully, we caught it early and a partial mastectomy has kept Elsie cancer free. In 2010, Elsie ended up with aural hematomas in both ears, and in 2011 she was diagnosed with a leiomyoma at the base of her tail – a kind of benign tumor. Although Elsie has been spirited through all of her six surgeries over the last three years, I did not fair so well. Each surgery was a brutal reminder of her mortality, and as I found myself pulled towards depression, I realized what we needed was a project, something unique to do together. It had to be something positive and fun, something that maybe we could even share with others. With a bit of paint, a few treats and some dog shampoo standing nearby, Elsie and I decided to create art – but not just any art. 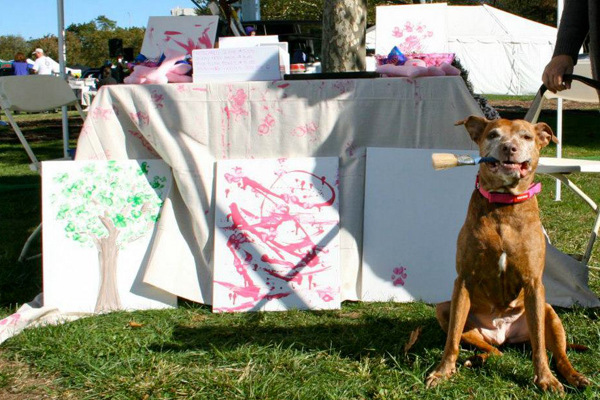 We use pink paint (dog-safe, of course) to represent her breast cancer survival. Elsie uses her paws, her tail and whatever else she can get on the canvas to leave her mark as a pit bull that is so happy that she wants to share the love with everyone. 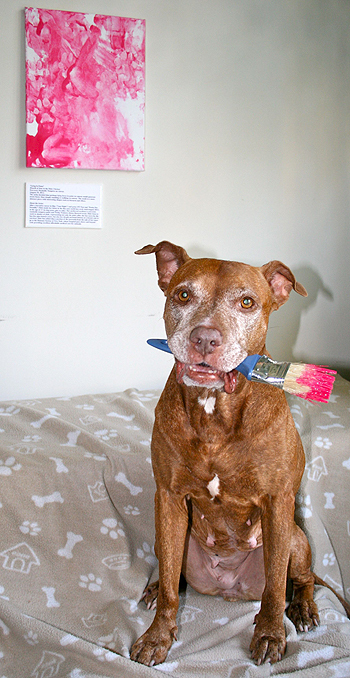 With the help of fellow pit bull lover, Leila Nelson, Elsie’s art has blossomed into a full-fledged website, Something Elsie, featuring Elsie’s art and other fun things she does as a cute, friendly and well-respected member of the community. Elsie puts a smile on the face of every single person she meets – and she meets a lot! She loves stuffed animals, sitting on laps or feet, and despite what people did to her early in her life, what she loves most is making every person feel like they are the most special person in the world. 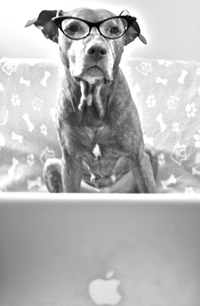 Elsie is an exquisite example of a pit bull’s strength of character marked by the ability to forgive. Thanks to our first appearance on StubbyDog, Elsie’s artwork has made its way to 10 different states and even across the sea to Germany! We’ve been able to make regular donations from a portion of the proceeds to the Humane Society of NY (whose amazing medical team has taken such good care of Elsie all these years at an affordable cost) and plan to also contribute to the rescue groups working tirelessly to save the lives of pit bulls from Manhattan Animal Care and Control, where Elsie originally came from and where I started volunteering this summer. Elsie has acquired her own Facebook fan page where she features her new art, silly pictures of herself, and updates on her life, including surgery number seven which happened in March and resulted in the loss of a toe. But all is well and Elsie simply celebrated her three-toed foot with some new paintings showing off her now very unique paw print. At 10 years old, Elsie’s hearing is a bit wonky, her naps are longer, her walks shorter, and her face whiter, but her zest for life and love for every person she meets is still going strong. 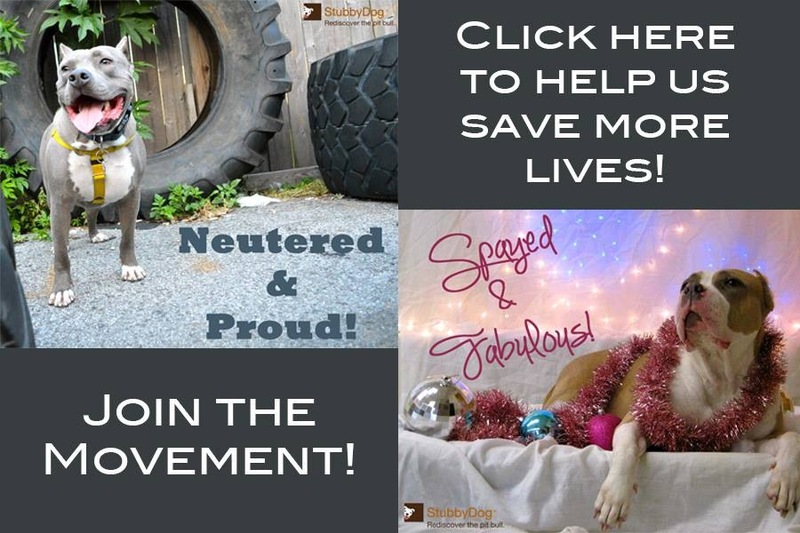 Through her art she continues to promote the message that every dog deserves a warm and loving home and should never be judged by breed or appearance but by their spirit. She looks so much like my Emma, and with an almost identical story. So wonderful to hear what you’re doing! Elsie is so talented, and has fun making her beautiful paintings. How do I get a hold of Elsie and her mom? I d like to purchase her art and tried to email Elsies owner through Elsie’s actual homepage. @KVCowl Hi KVCowl, Elsie’s owner here. Did the email not work or bounce back? I recently changed the contact address to [email protected]. Feel free to email me at that address and I’ll look into making sure it works on the site. Thanks for posting here! Elsie is beautiful and so is her artwork!!! Bless you both!!! Elsie is beautiful and so is her artwork. Bless you both!!! What a neat story! Elsie and you have been through alot together. You have such a special bond. Thank you for sharing your love for each other through Elsie’s art! The world needs the joy in her art. @Matt.S And her art brings lots of joy to everyone, thanks Matt. @Arleen J Rutten We are in that group too Arleen, she’s a special girl for sure. @Arleen J Rutten Awww, thanks. Elsie hopes to touch the hearts of many and her future projects hope to make the world a more welcome place for shelter dogs and pitties. @larshine Awww, thanks for the support! And for helping Elsie reach her goal of touching as many people as possible…she loves to be loved!